This page will, hopefully, be updated soon. The Browning .30 calibre, an American gun used by British forces. The Browning came in two calibres, .300", refered to as the, '30 cal.' and .500", refered to as, 'the 50 cal.' The 30 cal. is the more usual one to fit on an Austin Champ, I don't know if the 50 cal. was ever used but it well might have been. When the Browning was first in-service with the British forces it was in .300" calibre (called its, 'native calibre'), as 7.62 mm NATO ammunition was adopted many of the 30 cals. were converted to 7.62 mm. 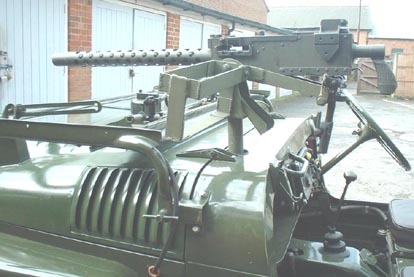 Does it matter now whether a Browing displayed on a Champ is in either .30 calibre or 7.62 mm?, probably not. But, I wanted an uncoverted Browning and it caused me much hassle. Time and again I contacted dealers and asked if they had an uncoverted Browning 30 cal.? I eventually found one and I specifically asked the dealer three times if it was unconverted, the dealer said, 'Yes' each time, the gun arrived, it was a converted one, the dealer, at first said, 'It doesn't matter.' I got my money and delivery costs back after an awful lot of trouble. Value of 30 cal. in 2013?, I have searched the web but didn't find any, £750.00 to a £1,000.00? Below is the id plate of the Browning mount.